"This course has given me strategies to deal with family situations in a positive, confident and loving manner. Thank you!" "The best thing about doing Parents with Courage was feeling less alone in my parenting and having the support and sharing of other people in similar situations." "Thank you for the light at the end of the tunnel. I feel a big weight lifted." "Parents with Courage has been a life changing course for me and I can see the benefits it has passed on to my children." "Many realisations leave me with no doubt that I will be a better parent and husband." "Parents with Courage for me, is about learning you have the courage to change those things from your own upbringing which have a negative impact on your parenting style with your own children today." "The wisdom and insights have given us a new and fresh more loving dimension to our parenting. Thank you." "Even my kids have commented things have changed which is great!" The aim of this session is to encourage and motivate parents and to introduce them to the notion that understanding their own early life experiences will enhance their parenting. The teaching paints a broad canvas of the principles that make for a healthy family dynamic in which the individuals are nurtured and developed and relationships are fulfilling. The elements that produce dysfunction and increased challenges in a family are also described. This session provides an opportunity for participants to do a brief overview of their family of origin using the Family Adaptability and Family Cohesion Questionnaires. This is useful for assessing the level and type of attachment in their family of origin, which is important as this has a direct influence on intimacy in relationships. It is also helpful for a couple to see how their own experiences of family dynamics may be similar to and different from each other. Identifying some of the differences can lead to greater unity in their approach to parenting. Family birth order is explored in this session, giving important insight and greater understanding of how to adjust parenting accordingly. Characteristics of a child according to their birth order, and tips for nurturing each child according to their birth order are looked at in detail. The teaching of love languages is covered as a useful tool for parents who will greatly benefit in knowing which “love languages” best communicates with their child. The aim of this session is to introduce the usefulness and practicality of family meetings as a communication tool for defusing conflict, resolving issues and setting goals and plans. 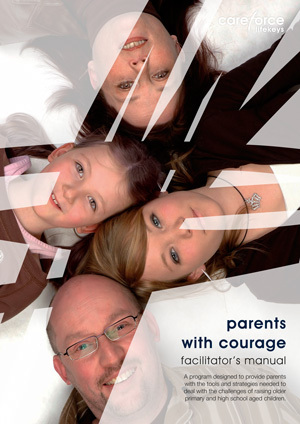 This session aims to model, teach and give instructions for conducting a family meeting. Parents will learn how to take principles and apply them to their individual circumstance giving consideration for the age and developmental stages of their children and the level of conflict in the home. This session aims to give parents practical ways of identifying and establishing boundaries with their children. It examines the issue of overcoming resistance and non co-operation, dealing with noncompliance and the common reasons for non-cooperation of a teenager. This session addresses some of the core aspects related to the challenge of parenting our children in an environment that often competes with our values in relation to sexual relationships. Parents need guidance to help their kids negotiate pre-puberty, puberty and their emerging sexuality in a healthy and life affirming way. This session provides an introduction. Your Family: Living Room or Court Room? This session looks at the origin of the human struggle for love, acceptance and belonging. Parents need insight into the nature of this struggle as it will help them identify their own needs and give them greater understanding of the needs of their children. The teaching deals particularly with the tendency we all have for using performance and people pleasing as ways of feeling accepted, loved and valued. When we parent out of our brokenness it can damage our children and our family. We need to understand the dynamic of this and examine wither we are using our family to meet this need. Awareness of this can assist parents to let go of unrealistic expectations and parent in a more relaxed and healthy style.